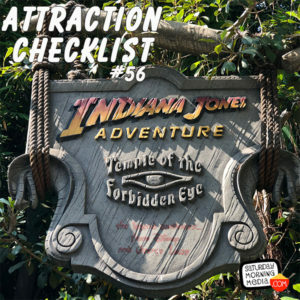 http://www.attractionchecklist.com – This episode, John B. deHaasand I head to Disneyland to ride one of the park’s marquee attractions, Indiana Jones Adventure. How will this ride rate? Tune in and see! Recorded on July 27, 2018. If you love adventure, you’re going to love this episode as we head to Disneyland to ride the classic, Indiana Jones Adventure! There’s no description for the attraction in the current guide maps, but the website describes the ride by saying: Embark on a fast-paced thrill ride in search of Indiana Jones—enter this cursed temple at your own risk! Guests must be 46” or taller to ride this attraction and The Thrill levels says this ride is a Thrill ride with small drops that is Dark Loud and Scary. Fastpass is available for this attraction. Before we meet up with Indiana Jones, here are five fast facts about Disneyland’s Indiana Jones Adventure. 1. In August of 1993, construction began on the Indiana Jones Adventure. The project was so massive that part of the Jungle Cruise River and the Monorail track had to be rerouted in order to accommodate it. 2. The attraction officially opened on March 4, 1995 as part of Disneyland’s 40th anniversary called 40 Years of Adventure. 3. Indiana Jones Adventure has one of the most immersive and carefully detailed queues that lead guests deep into the temple of the forbidden eye. Petroglyphs throughout the queue warn guests of the dangers ahead. In the first two years of operation, guests were given decoder cards so they could translate the petroglyphs in the queue area. 4. The ride vehicles for the attraction are known as Enhanced Motion Vehicles. Even though it often feels like you’re going much faster, each vehicle only has a maximum speed of 14 miles per hour. As the vehicles are computer controlled, the ride experience is never exactly the same no matter how many times you ride it. 5. Three audio-animatronic figures of Indiana Jones appear in the attraction. And the character is voiced by the suitably named actor David Temple. Let’s head to the Lost Delta and ride Disneyland’s Indiana Jones Adventure. Joining me today is John B. deHaas and after we ride we will discuss our thoughts on this classic attraction. This is a binaural recording so if you have headphones, put them on now as we ride Disneyland’s Indiana Jones Adventure!